Really nice race however did not like the start. The Course was beautiful and Laurell Hill was not as bad as everyone makes it out to be. On a wed evening after a few measly minutes of prodding, I talked my friend E.C. 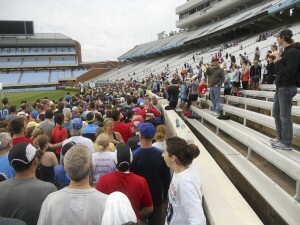 into running the Tar Heel 10 Miler with me. 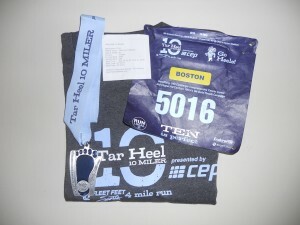 This race would be the 1st race for me since Umstead 100. I was a little worried about how the legs were going to do and If I was sufficiently recovered from that event but I would be pleasantly surprised. The day started with E.C. meeting me at the house at 5:30 race day morning. Neither of us got up in time to eat so a stop a McDonalds was in order as well was a stop to get fuel for his truck. After we acquired both types of fuel we were off to Chapel Hill. A nice short ride and I enjoyed the conversation. Upon arriving at UNC Campos we struggled a little bit on where to park and finally decided to park in the lot directly across from the Children’s Oncology Depart. A parking deck that I am l unfortunately way to familiar with. That, however, is a story for another time. We gathered our stuff and finished changing into our race stuff. The weather was in that in-between temperature where when you were not moving, or standing in the shade, or the wind was blowing on you ….you were cold. However not quite cold enough to run with an outer soft layer so I chose to go with the MTC Singlet and shorts knowing I was going to be cold while NOT running. On the way to the stadium we ran into Mike W., coincidentally he was the official that did the course certification for the 10 Miler, and chatted with him for a few. Once the gun went off we filed down onto the track and made our way under the timing gate (almost 2 min. after the starting gun!) and out of the stadium. I wish that I could tell you that I remembered each and every one of the turns but I just don’t. They ran us around the stadium a couple of times and in front of the same band at least twice before we went out into the town and residential areas. The town was fun to run through and I recognized some of the names of places but not many. All of the intersections were blocked off with police officers and everything was going smooth. E.C. and I were holding an excellent pace, somewhere around 8:00-8:15 any given time. Then we exited into the residential area. Through this area there were lots of hills and some very nice houses and If I remember correctly there were a couple of aid stations. E.C. was starting to complain about getting tired so I suggested that he grab a Gu from one of the volunteers. He did, shot about ½ of it and threw the rest away, let’s just say he was NOT very fond of them. Hahahaha. 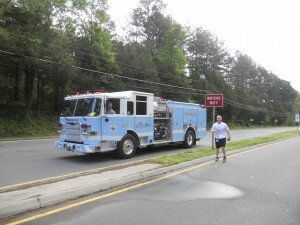 During one stretch around mile 6-7 we came up a Carolina Blue Fire Truck and I said “Now how often do you see that?” E.C. agreed and HAD to stop to get his picture made with it. The Race within the Race, which featured a timing mat at the bottom and another timing mat at the top! Yes, they would post results and give awards for the 3 fasted up the hill which was pretty cool. I had read some reviews and talked to some people about this DREADED HILL with only 200ft of vertical climb. To be honest I think I might have given this hill a little too much respect. If you know me you know I like to run hills, so naturally there was plenty of “Talk” leading up to the race and who was going to beat who up the hill. As the lower timing mat neared I started prompting E.C. on what we were going to do. “Ok, so there it is…Once we cross the mat it’s on!” EC:” On you lead and I will chase” Under the mat we went and Off I went. At one point when I looked at my watch I was running around a 5:40 mile, but I felt good so I kept pushing. As I neared the mid-point where the hill flattens a little I started to get really fatigued, but the fear of getting passed re-stoked the fire and I was back on the way. As promised when I crossed the top mat I waited for E.C. to catch up with me. After Laurel Hill and E.C.’s brief recovery we continued on to the finish ,which is only about ¾ of a mile…and to my astonishment we were “CHICKED” . Oh my gosh are you kidding me? I started bolting after these girls and my buddy behind me started to grunt and make weird sounds saying he could not go any faster, LOL…..this just gave ammunition for future heckling. We finished once again in the stadium. Once we knew exactly where the finish line was we pushed nice and hard and finished strong. The directors then had you go around the track and pick up your medal, which I have to admit was a very sweet medal. We milled around there for a little while then found our way to the post-race expo and the food. We met up with other BCRT Members, took some photos and It was time to head home. 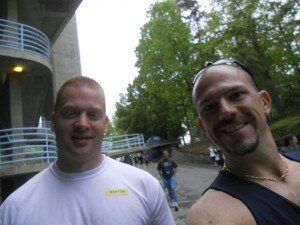 Overall enjoyable race would do it again if I signed up early enough and was not so expensive.